Make sure your facility complies with current building code guidelines by choosing an ada bleacher for your next project. The added aisle, handrail and wheelchair cutout with companion seat will do the trick. 5 row x 15' ADA bleacher-Seats 34 + 2 HC Seats 726 lbs. 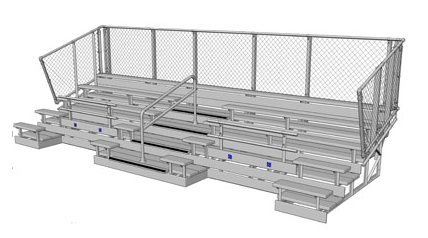 5 row x 19' - 6" ADA bleacher-Seats 45 + 2 HC Seats 928 lbs. 5 row x 21' ADA bleacher-Seats 48 + 2 HC Seats 969 lbs. 5 row x 27' ADA bleacher-Seats 58 + 4 HC Seats 1261 lbs. 8 row x 15' ADA bleacher-Seats 58 + 2 HC Seats 1280 lbs. 8 row x 19' - 6" ADA bleacher-Seats 75 + 2 HC Seats 1571lbs. 8 row x 21' ADA bleacher-Seats 77 + 4 HC Seats 1712 lbs. 8 row x 27' ADA bleacher-Seats 100 + 4 HC Seats 2156 lbs. 10 row x 15' ADA bleacher-Seats 74 + 2 HC Seats 1619 lbs. 10 row x 19' - 6" ADA bleacher-Seats95 + 2HC Seats 2012lbs. 10 row x 21' ADA bleacher-Seats 99 + 4 HC Seats 2199 lbs. 10 row x 27' ADA bleacher-Seats 128 + 4 HC Seats 2774 lbs. 10 row x 33' ADA bleacher-Seats 161 + 5 HC Seats 4700 lbs. 5 row x 15' ADA bleacher-Seats 34 + 2HC Seats 1111 lbs. 5 row x 19' - 6" ADA bleacher-Seats 45 + 2HC Seats 1280 lbs. 5 row x 21' ADA bleacher-Seats 48 + 2HC Seats 1414 lbs. 5 row x 27' ADA bleacher-Seats 58 + 4HC Seats 1707 lbs. 8 row x 15' ADA bleacher-Seats 58 + 2HC Seats 1816 lbs. 8 row x 19' - 6" ADA bleacher-Seats 75 + 2HC Seats 2063 lbs. 8 row x 21' ADA bleacher-Seats 77 + 4HC Seats 2311 lbs. 8 row x 27' ADA bleacher-Seats 100 + 4HC Seats 2743 lbs. 10 row x 15' ADA bleacher-Seats 74 + 2HC Seats 2500 lbs. 10 row x 19' - 6" ADA bleacher-Seats 95+2HC Seats 2586 lbs. 10 row x 21' ADA bleacher-Seats 99 + 4HC Seats 2888 lbs. 10 row x 27' ADA bleacher-Seats 128 + 4HC Seats 3443 lbs. 10 row x 49'-6" ADA Bleacher Seats 246+6HC seats 6870 lbs.